A-WOL offers beginning to advanced aerial skills classes on low flying trapeze, silks, lyra, and aerial yoga. 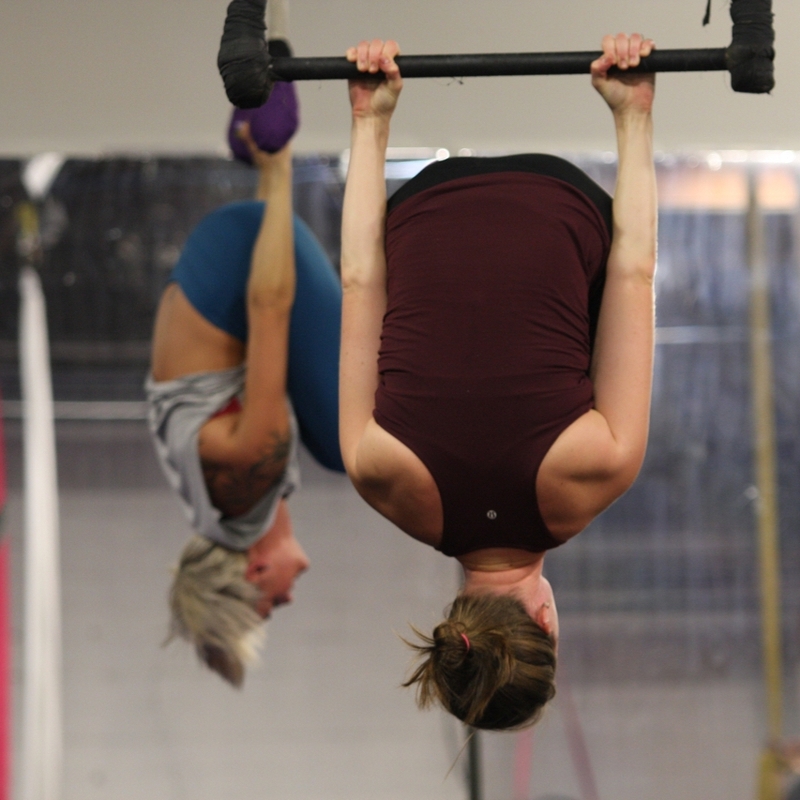 Our classes focus on developing aerial technique, body awareness, and fitness, while providing an engaging environment for creativity. All ages and levels are welcome! Learn to fly with us! Whether you're an experienced aerialist or a brand new beginner, we offer classes for any level every day of the week. If you're brand new to aerial, one of our Level 1 series is the place to start. We recommend Fabric or Trapeze 1 before branching out to other apparatus. We offer series for Sling, Lyra, Aerial Pole, Rope and more! Elevate your yoga practice to a new level! Aerial Yoga follows the same principles as mat-based yoga classes, while implementing a fabric hammock to provide stability and support as students move through their class flow. We offer Aerial Yoga classes in a variety of styles, to accommodate whatever type of workout our students are looking for. Aerial Yoga-Basics is recommended for new students before progressing to our other Aerial Yoga offerings. These classes are for students looking to start a new strength-training regimen or seeking to mix up their current fitness routine. FlyFit and Flexibility are open to students of all levels- no prior experience necessary! Students participating in Aerial Conditioning should be familiar with basic aerial techniques such as climbing, and inverting. Each week FlyCo comes together for 3 full group rehearsals: Thursday night we have 2 hours of ground based solo, partner, and group acrobatics, Friday afternoons we have conditioning and technique, and Sundays we have 3-4 hours together and cover many different things but typically we spend an hour on dance, skill building on vertical and bar apparatus, and flexibility as well as special workshops like injury prevention, building your choreography tool box, stage make-up application, and many more. In addition to our FlyCo group rehearsals each member takes an hour of dance, 2 aerial technique classes, and 2 fitness classes (like aerial conditioning, flexibility, or aerial yoga). The students also attend open gym times to hone the skills they are learning in class. The majority of our youth programs run as part of our 10-Month School Year Program. Enrollment for the 2018-2019 program is currently open! We also offer ongoing 8 week sessions on Saturdays for youth ages 4-11. These classes are open to new students throughout the year. If you are interested in registering a child for any of these classes, please send an email with your child’s name, age, and desired class time, as you cannot complete the necessary steps online. All students must have a safety waiver with parent or legal guardian signature, prior to participation. (This cannot be a friend’s parent, it MUST be a legal parent/guardian). Enrollment for the 2018-2019 School Year Program will open in July. In the meantime check out our camps, 8 week sessions, and private lessons. Our teen classes are specially-designed for students 12-17 years old. Most of our teen classes run as part of our 10-Month School Year Program. Enrollment for the 2018-2019 program is currently open! We also offer drop in classes during the week. Beginners start with Teen Fly 1, to learn the basics of the silks and trapeze. All of our teen drop in classes are ongoing, so students are welcome to join and attend throughout the year, although we recommend preregistering to ensure a spot on the roster. All students must have a safety waiver with parent or legal guardian signature, prior to participation. (This cannot be a friend’s parent, it MUST be a legal parent/guardian). Enrollment for the 2018-2019 School Year Program will open in July. In the meantime check out our camps, drop in classes, and private lessons. A-WOL Summer Camps for Youth and Teens! A-WOL offers a variety of camps to youth ages 4-11 and teens ages 12-17. Camps take place in both our beautiful Portland Warehouse and outside in the trees at Mary S. Young park in West Linn. Over the course of the week campers will learn fun new aerial techniques using various apparatuses. Camps also include basic tumbling, dance, strength and flexibility training, as well as teaching students to utilize their creativity and expression. The week will culminate with a small performance for family and friends of what they have learned. This is sure to be a memorable experience for both campers and parents. We recommend students wear stretchy exercise-type clothing that allows you to move freely. (Capri pants work best.) Our warehouse temperature fluctuates throughout the year so layers can be very helpful. No necklaces, rings, or large earrings are allowed. (They tend to get caught and can cause injury to you or other students or damage to the equipment.) Please refrain from wearing lotions (as this makes equipment difficult to grip) and perfume or oils (as they can be disruptive to other students’ enjoyment of the space). A water bottle and a willingness to learn. Please Be on time to class! Warming up is the key to injury prevention. Students who arrive more than 10 minutes late to the designated start time will be asked not to participate (and not eligible for a refund of the preregistration purchase). If you can’t find what you’re looking for or are having trouble, email fly@awoldance.org. We’re happy to help!